Bruce described the stages of learning using martial arts, but we discuss these lessons in a broader application as a metaphor for learning anything. In the beginning when you are learning something, and you’re asked to throw a punch, you do and there’s no technique or learning behind it, a punch is just a punch. In the second stage of learning you start to break down all the components of a punch. You understand your stance, your fist, you practice, and you try and find the best punch. A punch is no longer just a punch. Finally, in the third stage you return to “A punch is just a punch.” Except this time, it’s something you have broken down, practiced, understood, and integrated, such that you no longer have to think about it, it’s automatic yet skilled. These ideas can be applied to learning anything—it’s a progression from novice to mastery. Sometimes we don’t make it out of the first or second stage of learning, depending on our enthusiasm about the topic or skill. We have to want to get to that next level. It’s easy to get hung up in the second stage, with too much dissection or too much focus on the individual pieces. We get stuck in our heads and then we can’t return to the natural state of the skill where there is no thinking. Synchronization of self: first really getting to know yourself, who you are, what you’re trying to accomplish, where you are in the moment when you’re trying to learn. Synchronization with opponent: being in relationship with someone or something else or your environment, broadening your view. Under fighting condition: You’re in a real life situation, you’re engaging in real scenarios (playing for an audience, fighting a real opponent, etc.) This is when you find out if all your techniques and study work in the real world. In Bruce Lee’s famous Oakland fight, he recognized the inadequacies in his classical Wing Chun training when put in a real, no rules fight. This realization inspired him to pursue additional techniques and evolve his own martial way called Jeet Kune Do. The mistakes in those real life situations are the things that teach you what you still need to know. Partiality is the compartmentalized man. You have lots of extremes and you are trying lots of different things. Bruce’s symbol for this stage was the two halves of the yin yang, separate, not touching, and without the circle in each half. He called it the running to extremes. Fluidity is when you can take what happens as it comes. Bruce Lee called this two halves of one whole and his symbol was the complete yin yang with two arrows going around the yin yang. This symbolized that these two halves are always relating, we’re always in a place of totality. The third stage of cultivation is Emptiness which Bruce Lee called the formless form. This is when you exist in a stage of natural response and you let go of all technique. The third stage is about freedom. You don’t have to live in the third stage all the time, it is achieved in moments of action in real life situations. Stage 3 is the automatic response of the skillful warrior. It is inevitable that you’ll experience frustration during stage 2, especially when you’re trying to achieve stage 3, but being frustrated and then overcoming it, actually shows that you’re capable of doing. In the context of learning something new, frustration is a clear spotlight of where you need to work on something. Sometimes the frustration indicates that you need more practice or sometimes it means you need to throw out your current method and try a new method. 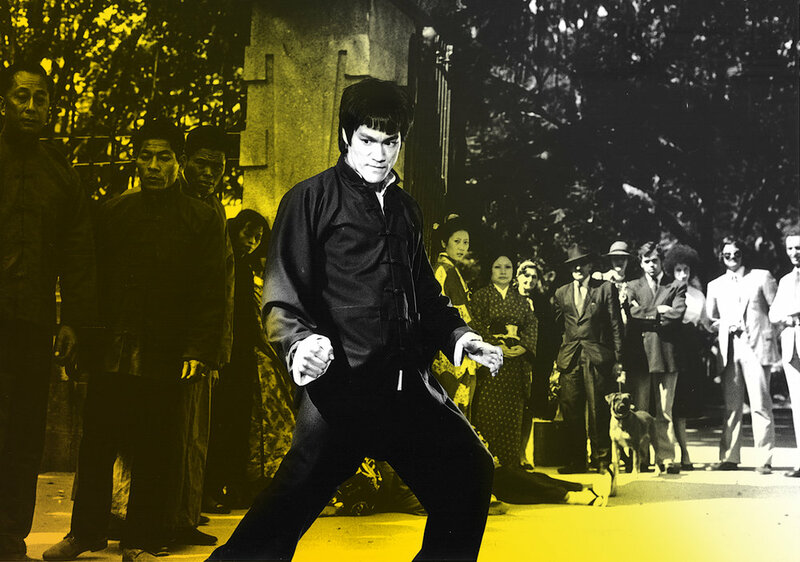 Bruce Lee used martial arts to learn about himself as a human being. When we learn something new, then we learn more about ourselves. Try an experiment: Go out and decide what you want to learn. Have these stages in mind to use as a vehicle to learn, but also to know oneself. If you’re looking to break through from stage 2 to stage 3, look for your points of frustration to find the things that you need to work on. We are in the second and final week of the Bruce Lee Podcast Challenge! We’ve been making a daily practice of three action items from previous episodes and we’ve invited all of you (our listeners!) to participate. We hope you’re getting as much out of it as we are. We’re really looking forward to sharing our experience with you. It’s not too late to join us for the last few days. We can’t wait to read all your submissions! This week our #AAHA shout out goes to Nellie Wong, poet activist for feminist and socialist causes. Wong was born in Oakland, California in 1934, to Chinese immigrants. Her Father had immigrated to Oakland in 1912. During World War II, the Wong family worked in a grocery store in Berkeley. The interment of her Japanese American neighbors left a profound impact on her intellectual development, sensitizing her to issues to racism and concerns of Asian Americans. The family started a restaurant, The Great China, in Oakland’s Chinatown, where Wong worked as a waitress during her youth. While in her mid 30s, Wong began studying creative writing at San Francisco State University (SFSU) and began to write and publish her poetry. Wong credits her feminist classmates at SFSU with encouraging her writing. A male professor had once told her to throw away an angry poem she had written. One classmate told her, “You don’t have to listen to him!” In the 70s, Wong co-founded the Asian American feminist literary and performance group Unbound Feet. The group performed at colleges, universities and community centers. During the 1980’s and 1990’s, Wong was keynote speaker at many national and regional conferences, including Third World Women and Feminist Perspective, Women Against racism, and the national Women’s Studies Association. She has recited her poetry in China, Cuba, and through the U.S. She has also participated on panels concerning labor, Asian American literature, and poetry. Furthermore, Wong has taught Women’s studies at the University of Minnesota and poetry writing at Mills College in Oakland, California. Excerpts from two of her poems have been permanently installed as plaques at public sites at the San Francisco Municipal Railway. She has received awards from the Women’s Foundation (San Francisco), University of California, Santa Barbara’s Asian American Faculty and Staff Association, and the San Francisco- based Kearny Street workshop, a multidisciplinary art collective. We love and celebrate you, Nellie, for releasing your passion out into the world and thank you for being such a brave and great role model for other Asian women! You’re awesome! First off I want to say thank you for taking the time to read this email. I know you are all pretty busy people, so thank you. I’ve been listening to your podcast for quite some time now and love it. It’s great to hear in depth discussions about his philosophy as well some personal stories about him as well as Brandon Lee. Hearing the personal stories are my favorite cause it reminds us that he was human and not a God on Earth. hahaha So like everybody else I’m a huge Bruce Lee fan and will love to talk more about him and his impact on my life, but for now I just want to focus on your episode about Bruce’s health and nutrition. I’ve studied Martial Arts for most of my childhood up until I was 17. I stopped due to family problems and then went off to college. I feel that I have always in been in good health, but the knowledge of knowing that as I get older the body becomes frail. So about 4 years ago I decided to start getting in shape again. I also wanted to get back into martial arts. Watching the “Ip Man” movies were a real spark of inspiration for me to do so as well watching all of Bruce Lees movies. This is surprising, but I honestly never saw a Bruce Lee movie until I was in college. As a kid I only knew him as the guy who made those crazy screams when he was fighting. When it came to working out, I had a workout regimen I did for about 3 years, and it made a huge improvement on my body. However, after doing this for so many years it has become a bit tedious and boring to a point that it was hard to work out. So I started to ask myself why I want to workout. What is it that I want to improve on my body and why. So like Bruce I was starting to more at a function body than just having a ripped one. So now I’m doing a variety of workouts to improve my punching capability, gain a higher kick, and over all have more energy and stamina. I also do some things to improve my lower back as my jobs demand a lot of bending over and after doing that for 8hrs my back feels like crap. So in the end I just wanted to say that Bruce Lee’s idea of working out really hit me because that’s exactly what I was doing, but never thought of it that way. Having awesome muscles and a rip body is good and all, but what good are they if they don’t function the way you want them to. Thank you for your time and keep up the great work.